Also attending were Newport-Mesa Unified School District Liaison Dr. Kirk Bauermeister and Costa Mesa Chamber of Commerce Liaison Brent Stoll. Council Liaison Katrina Foley was absent. Four (4) members of the public attended. Facilitator Rock Miller, from the consulting firm Stantec, was introduced to the group. His presence will be very helpful to the committee as they move steadily forward with their tasks. The bulk of the meeting, nearly 90 minutes, was spent carefully crafting the six (6) goals of the group. The staff had homogenized the original presentation from the previous meeting with contributions by the committee members - a list that included proposed Goals, Objectives and Policies. They took each goal one at a time, carefully dissecting the text to be sure the verbiage precisely reflected their opinions. When the process was completed for each one a vote was taken and, in every case, there was unanimity on the end result. 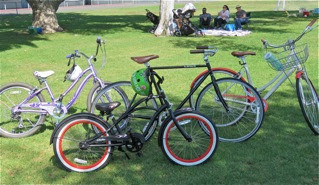 Create a bicycle and pedestrian friendly environment throughout Costa Mesa for all types of users and all trip purposes in accordance with the 5 E's (Education, Encouragement, Enforcement, Engineering and Evaluation). Provide a safe, convenient and attractive bicycling and pedestrian environment through application of design standards, uniform signage, enforcement of traffic laws and maintenance practices to encourage and increase the the use of bicycle and pedestrian facilities. Provide bikeway and walkway facililties that are integrated with other transportation systems and land use planning decisions. Develop a culture that respects and accommodates all users to foster a more balanced transportation system. Encourage active transportation by promoting air quality, health and economic benefits and by pursuing multiple sources of funding for active transportation programs and facilities. Ninety minutes, you say! Yep, it took that long to wordsmith the Goals to be sure they each accurately reflected the vision of the group. The deliberations/discussions were done in a very positive, respectful manner. At the next couple meetings Chairman Taboada will lead them as they will tackle the Objectives of each Goal, and then the Policies necessary to achieve them. The process seems tedious, but those 90 minutes actually flew by as the committee members worked steadily and respectfully on this task. The members were encouraged to review the materials provided and send questions and/or suggestions to the staff, who will integrate them into the working documents. They were reminded to NOT communicate among themselves for fear of a Brown Act violation. A brief discussion was held about replacements for departed members. According to input from the staff, the City Council prefers they move forward with the current number and address vacancies early next year, when other committee recruitments will take place. During Committee Member comments at the end a suggestion was made by Huffman that a representative from the Orange County Transportation Authority (OCTA) be invited to brief the committee on the County plans for bicycle infrastructure, so that information could be folded into their process. The staff suggested waiting awhile, but Chairman Taboada agreed with Huffman, so the staff will approach the OCTA about inviting a representative to a meeting before the end of the year. The committee will meet on October 14th and 28th at the same time, 6:30 p.m., in the same place. 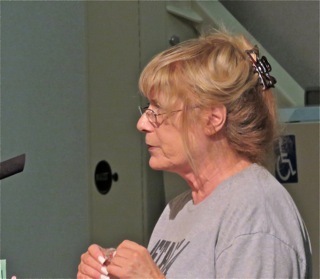 Beginning in November their meetings will return to the first and third Wednesday of the month. If you plan to attend any of these meetings wear a sweater or jacket - we could have hung sides of beef in the meeting room again last night. The meeting was adjourned at 8:45 p.m. Here's a little bit of irony for you. A couple members of the committee ride bicycles to the meetings, but there are no bike racks available at the Senior Center, so they bring their machines inside for safe-keeping. When I mentioned this to Director of Public Services Ernesto Munoz - one of the staff members present last night - he told a couple of us that he's working with CEO Tom Hatch to spring loose some money to install bike racks throughout the city as a measure to seed encouragement of bicycle riding. For those who have been following the Banning Ranch drama, it's possible it might be soon over depending on how the California Coastal Commission votes at their meeting next Wednesday, October 7, 2015 in Long Beach. The Banning Ranch Conservancy, HERE, has been leading the charge against the proposed development on that site, which includes 1375 homes, a shopping venue and a hotel among other things, for years. 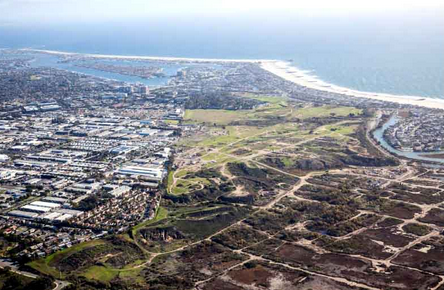 The Coastal Commission meeting might mark the most significant milestone in the history of this project. You can read the text of the 316 page Coastal Commission Staff Report HERE. Don't let the size of the document put you off. The summary contained in the first five pages should be enough. The staff is recommending denial of the project, but the commission is NOT obligated to follow their recommendation. A large public presence at the meeting is important to provide an exclamation point to this process. To provide that public presence at the meeting the Banning Ranch Conservancy is sponsoring buses to the meeting at the Long Beach Convention Center, Seaside Ballroom, in Long Beach, which begins at 9:00 a.m. You can also reserve a seat on one of the buses HERE. Additionally, they also have provided a link to a petition opposing the project that can be filled out and automatically sent to the Coastal Commission, HERE. 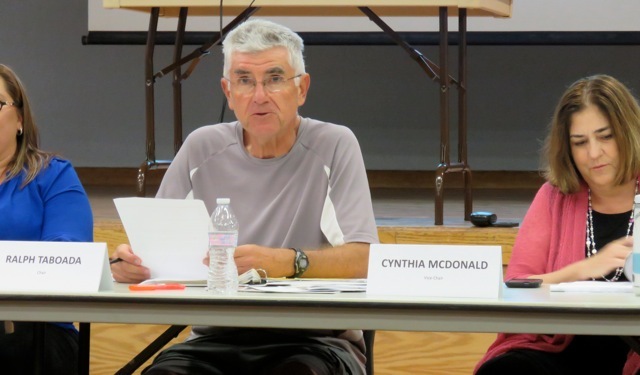 They are holding an organizational meeting tomorrow night, September 30, 2015 beginning at 6:30 p.m. at the Mesa Verde United Methodist Church, 1701 Baker Street. See the map here. Click on it to enlarge it. Everyone interested in this project is invited to attend to get more information. 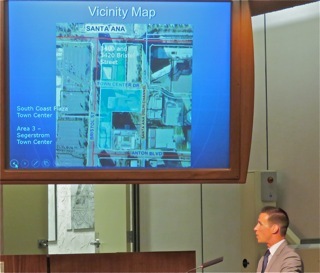 You may recall that this project will generate an estimated 15,000 car trips each day, the vast majority of which will funnel onto Costa Mesa streets and most will end up at the tip of the funnel - the corner of 19th Street and Newport Boulevard, which is already one of the busiest streets in our city. The developers, Newport Banning Ranch, agreed to pay the city around $4 million to mitigate the traffic impact, but those dollars will barely pay for a study, much less mitigate the traffic. Add that traffic to the new cars being generated by recently approved Costa Mesa projects and you'll understand what a nightmare driving on the Westside AND the Eastside of Costa Mesa will become if this project is approved and built. So, go to the Banning Ranch Conservancy website, linked above, and become familiar with the issue. Attend their meeting tomorrow and, if you're so moved, join them in Long Beach to guarantee the California Coastal Commission will get a clear idea of the opposition to this plan. 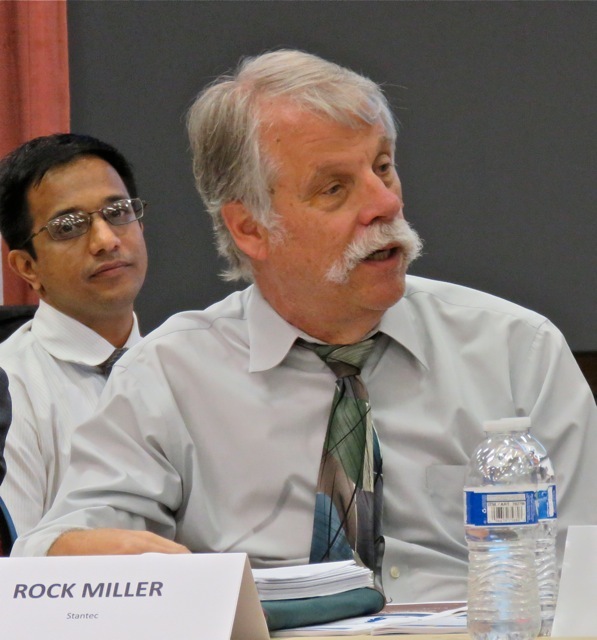 The final Planning Commission meeting of this month was a short one, with all the business completed by 8:15 p.m., barely two hours in duration. It was a nice relief to be able to get home and re-introduce myself to the sweet and very patient woman who shares my roof. Beth Refakes, member of the Military Affairs Team, reminded us of the Halloween candy drive for the children of the 1/5 Marines at Camp Pendleton. Each piece MUST be individually wrapped and placed in the box in the City Hall lobby. Item #2 was pulled from the Consent Calendar so Building Official Khanh Nguyen could make a brief report to the commission on the status of the Building Inspection Department. I showed you this graphic before. 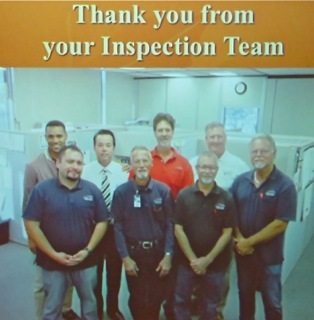 It shows you, in trimesters, the volume of building inspections done by city staff and contractors since 2005 - the year Nguyen began with the city. He explained that the staff, supplemented by one contract inspector, are working long hours and that the management team also goes out to inspect if necessary. You can see the dramatic dip during the recession and the rise to current record numbers today, from just over 3100 to over 11,000 today. 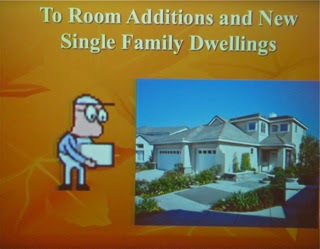 Nguyen went through the permitting process and showed many slides depicting various stages. 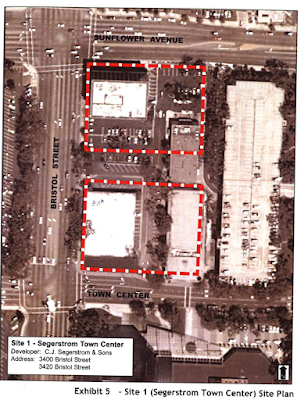 Public Hearing #1, the request from Segerstroms and Sons for a 20 year extension of the Development Agreement for what is known as the Segerstrom Town Center property. It took all of six minutes for staffer Minoo Ashabi to make her presentation, Segerstrom representative Justin McCusker to make his and for the vote to be taken - 5-0 - to recommend to the City Council that this request be approved. 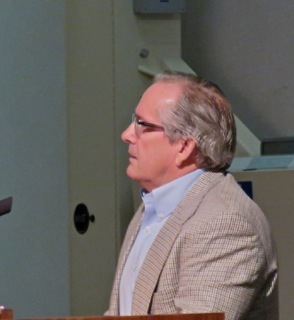 Public Hearing #2, the request for a helistop on the roof of a commercial building at 3132 Airway Avenue, adjacent to John Wayne Airport, didn't go quite so quickly. This item is a resurrection of the same request from 2011, which was denied by the then-Planning Commission and the applicant did not appeal it to the City Council. 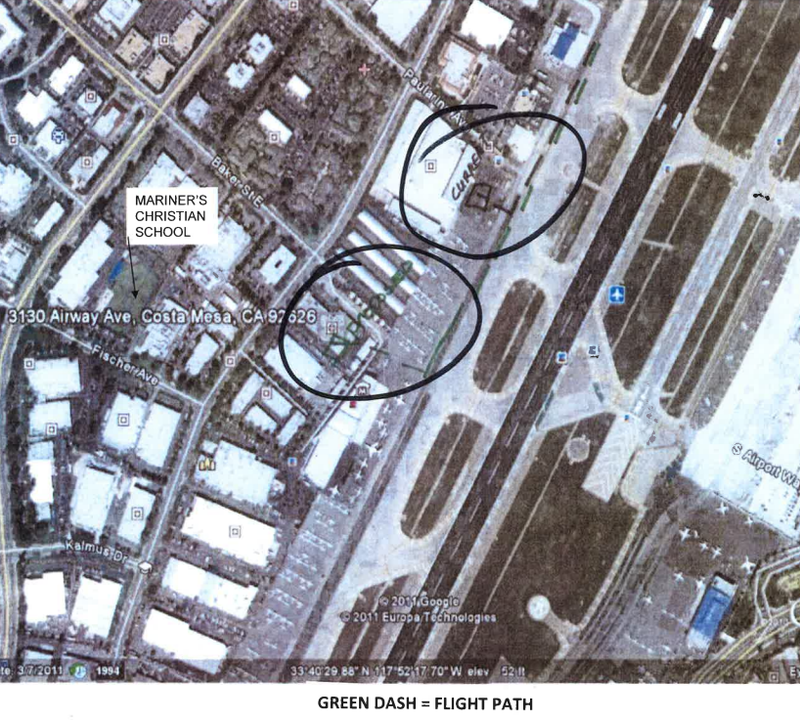 The applicant, Kevin Coleman, explained that this use would actually reduce the number of flights by this private owner, who currently houses his helicopter in a hangar on the John Wayne Airport grounds within 200 yards of this site. Property owner Denis Labonge stepped up to object to the proposal and said he represented several of the other occupants of the building in question. He spoke of the noise and dirt that his tenants would be subjected to with this use on the roof of the building - dust being forced down the air vents, etc. 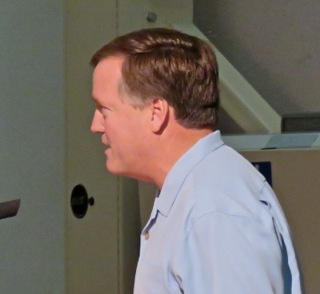 Helicopter Mike Manclark addressed the issue and clarified the uses of his machine currently and the anticipated reduced use if the request is approved. He spoke of the philanthropic uses of his helicopter throughout Costa Mesa. When the original request was denied by the Planning Commission they were missing a Noise Report, which was now available. 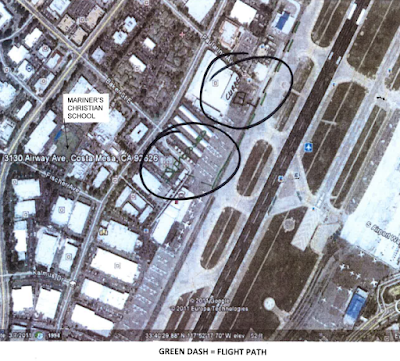 When this issue was considered in 2011 the City of Newport Beach sent a long letter suggesting approval of the request might be interpreted as an expansion of the John Wayne Airport footprint and, therefore, was against it. This time around former Costa Mesa senior staffer Kim Brandt, now a senior planning official in Newport Beach, wrote a letter transmitting that original document, reinforcing their opposition, which members of the commission apparently interpreted as flagging interest in this issue. 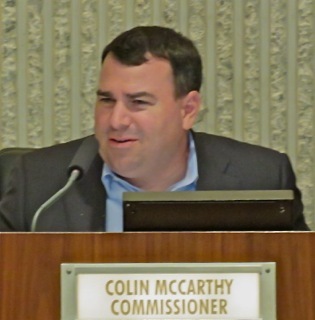 Commissioner Colin McCarthy carried much of the discussion and seemed peeved that Newport Beach would dare insert itself into Costa Mesa's business. He indicated early in the discussion that he didn't see the problem with the request. 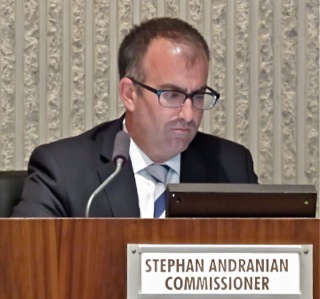 Other commissioners, including Chairman Rob Dickson and Commissioner Stephan Andranian, had some concern about the current helicopter - an EC 120 - being swapped out for a noisier one in the future. However, the proposal contains a condition restricting the noise levels to those made by this machine, so any new equipment would be held to that standard. Assistant Development Services Director Claire Flynn told the commission they actually had three alternatives. They could approve, deny or simply register their opinions and pass the decision on the City Council. 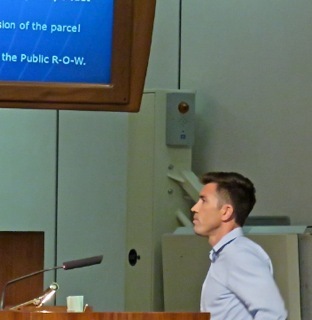 McCarthy balked at that one, and suggested they actually make a decision - which would be sent to the City Council for ratification in any event. 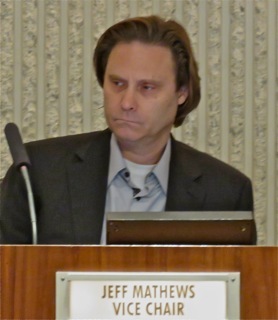 So, he moved approval of the request and Vice Chair Jeff Mathews seconded it. The commission approved it on a 5-0 vote. HERE IT COMES... THERE IT GOES! Public Hearing #3, a two year extension request for a development at 522 and 526 Bernard Street took six minutes flat for the commission to approve. 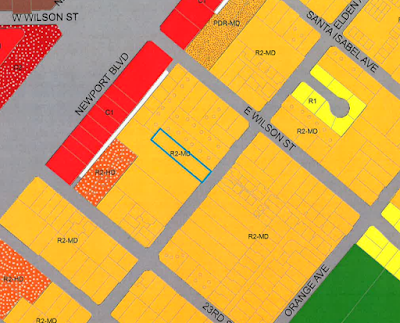 Public Hearing #4, the development at 2333 Elden Street, took a little longer to flesh out. Two minor deviations were being requested for this 5-unit Small Lot Development on a long, skinny lot. The only clinker in the discussion was the requirement for the project to have undergrounded utilities. 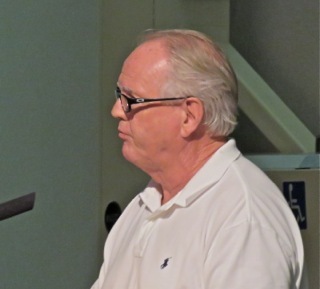 The owner balked at this suggestion because a consultant he hired to assess the situation told him that it would be quite costly, even if Southern California Edison approved it - and that was no slam dunk. For this to happen at least 3 nearby neighbors would have to agree to the undergrounding for their properties and that was complicated by the understanding that Edison would forbid any infrastructure to be built over their undergrounded lines. Unfortunately, the applicant had no letter from Edison to that effect. Nor did he have communication from the neighbors involved registering their opposition. If he had, the staff could have handled it without commission intervention. 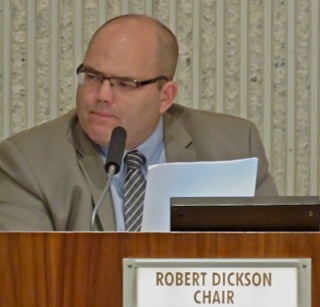 Even though they knew that, the commission approved the plan WITH the requirement that the undergrounding move forward, presuming the applicant would get the necessary objections from Edison and/or neighbors which would negate the requirement. They simply could have NOT required the undergrounding. Strange. Now this means more work on the part of the applicant and more staff time taken up on this issue. The project was approved, 5-0. 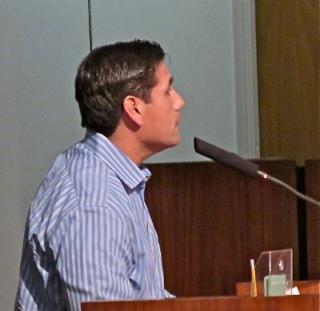 During staff comments City Engineer Fariba Faseli told the commission that the median and monument work was beginning near the Starbucks at DelMar and Newport Boulevard, near the community garden. Flynn told the commission that the information about the project at the Costa Mesa Motor Inn is now online and the project will be appearing before them at their next meeting on October 12th and will go before the City Council on November 3rd. In my haste to provide you with a roster of events for the coming week I completely forgot one of the most positive, uplifting events we have in the city each year - the Costa Mesa Chamber of Commerce-sponsored Public Safety Recognition and BBQ! 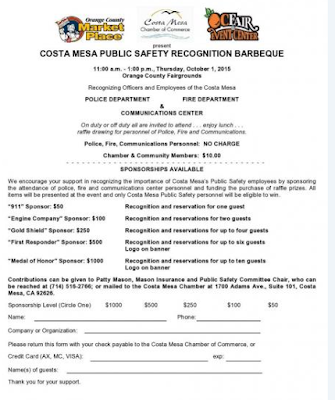 This year the event will be held on Thursday, October 1, 2015 at the Orange County Fair And Event Center from 11 a.m. - 1 p.m. All off-duty public safety folks are welcome to attend, enjoy the lunch and raffles. Members of the public are encouraged to participate - the event costs $10.00 for us. In addition, sponsorship opportunities are available as outlined in the following flyer. 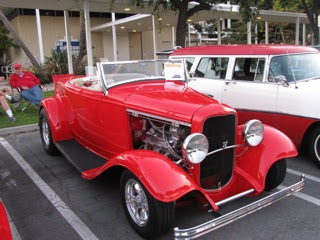 If you have questions, call Patty Mason at 714-516-2766. 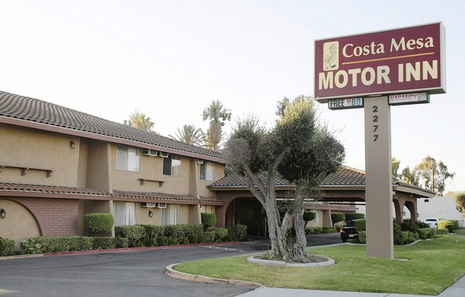 On Monday, September 28, 2015 the Costa Mesa Planning Commission will meet again for another adventure in Development Land. 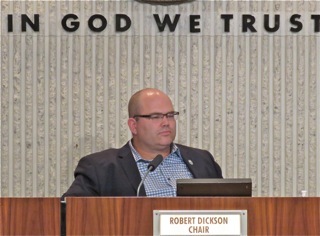 The meeting begins at 6:00 p.m. in City Council Chambers and will also be televised live on Costa Mesa Television and streamed live on the city website if you just want to hunker down in your LazyBoy and watch from the comfort of your home - and click back and forth between the meeting and Monday Night Football. You can read the agenda HERE. 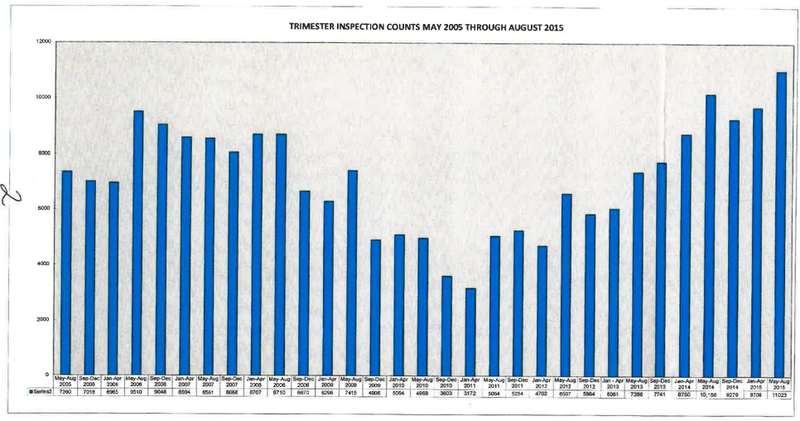 The Consent Calendar has a fascinating chart which purports to show Building Inspection Activity from 2005 - 2015, sliced in Trimesters. Does anyone else chop numbers into trimesters? I don't think I've ever seen it before. 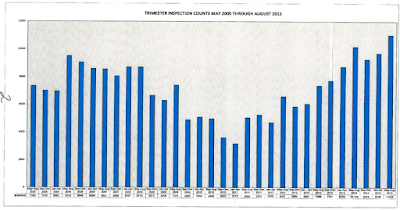 Anyhow, this chart shows a low of 3,172 inspections for the period Jan-April, 2011 to a high of the most recent trimester, May-August, 2015 of 11,023. Click on this chart to enlarge it. Public Hearing #1, HERE, is the request from Segerstrom and Sons for an extension of the development agreement entitlements for Segerstrom Town Center for another 20 years, until 2035. Public Hearing #2, HERE, it a conditional use permit request to install a 40 foot square helistop atop an existing building at 3132 Airway Avenue. This request was first considered by the Planning Commission in 2011, but was withdrawn by the applicant before the City Council could hear it... they're back. It's unclear what has changed since their last pass at this request, but I suspect many of the objections contained in the more than 130 page staff report from 2011 and 2012 still exist. Public Hearing #3, HERE, is a request for a two-year time extension to October 14, 2017 for a previously approved development at 522 and 526 Bernard Street, at the corner of Charle Street. The developer is having trouble finding financing for this project - one of those projects with lots of deviations and modifications. 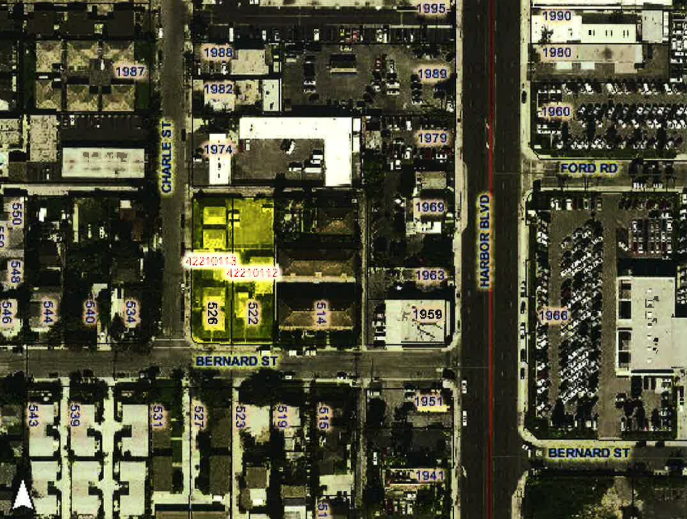 Public Hearing #4, HERE, is a Design Review for a 5-unit, two-story small lot subdivision at 2333 Elden Avenue. The staff is recommending approval. On Wednesday, September 30, 2015, the Costa Mesa Bikeway and Walkability Committee meets for their second meeting this month and the first on their accelerated schedule at the Costa Mesa Senior Center, 695 West 19th Street beginning at 6:30 p.m. You can view the agenda HERE. Unfortunately, if you want to know what's going on with this committee you'll have to attend or read my report since there is no live or recorded coverage by the City, and usually not by the local media, either. Presentation of September 2013 Public Outreach Meeting by Stantec. I plan to attend this meeting - they usually last a couple hours and have been very sparsely-attended in the past - and report the progress or lack thereof. This group is under the gun timing-wise if their efforts are to be considered in the General Plan update. They have a good attitude and seem to be straining at the bit to get started. Perhaps this meeting will be the time that happens. The latest edition of the First Friday Road Show will be held in the City Hall parking lot at 77 Fair Drive on Friday, October 2, 2015 beginning at 5:30. This is a great event, is free, usually has wonderful music and some good grub PLUS the chance to see some very nifty classic cars. It's great family fun on a warm Indian Summer evening.